Sarah Palin, who served half a term as governor of Alaska — quitting after an unsuccessful bid on the Republican presidential ticket with John McCain in 2008 — says she might run against Alaska Sen. Mark Begich in 2014. “People have requested me considering it,” she said, in one of her trademark Palinisms, speaking to Sean Hannity on Fox recently. Palin has strong backing from a trifecta of supporters: Tea Partyers, editorial cartoonists and comedians. The latter two groups would likely put in a lot of volunteer time for her — if for no other reason, as a career-boosting move. “While she wouldn’t ordinarily accept financial or other help from unions, we hope she’ll make an exception in our case. 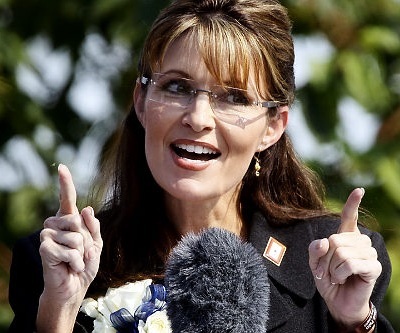 Palin is, after all, an exceptional case,” Cornball said. Ms. Palin told Hannity that after some time off to recharge and make some big bucks off her national popularity, she’s ready to dive back into politics. “But having half the popularity I used to have, that’s perfect — since I only plan on completing half a term anyway. It’s how I roll, how I stay fresh,” she added. “Shoot, I’m itchin’ like a mama grizzly to make some doggoned good speeches on the stump. And I don’t need no stinkin’ teleprompters,” she said, reading her palm. “Also, too, I want to help clean up the state that is so sorry today of journalism. And I have a communications degree,” Palin told a stunned Hannity. Ed. Note: We’d like to thank Sarah Palin for coming up with great material for us. Check the links — those quotes are real!